Sometime back in the late seventies, my sister introduced the family to a new salad dressing she had discovered. I no longer remember where or how she found it, but at the time it was only available in packet form, and you added the packet ingredients to mayonnaise and buttermilk. 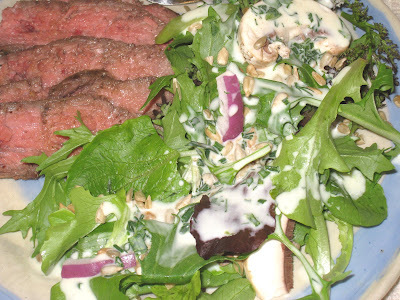 It sounded horrible, but one taste was enough to raise it front and center as the dressing of choice for our family. And it turned out that we were not alone. Within a few years Ranch Dressing was ubiquitous, and all of the major brands had their own versions of the stuff. Of course, the bottled versions tasted nothing like the original, but the convenience of not having to mix it up made it the more frequent choice, and over time I forgot how the original version tasted. And then I stopped eating processed foods and learned how to make this lovely vinaigrette. Because it is a versatile enough recipe that I can mix it up with different kinds of vinegars, oils, mustards and herbs, I rarely feel the desire to use any other dressing. What I do feel the desire for, however, is to find more uses for mayonnaise when I make it. I only make mayonnaise when I have a specific use for it and it does not have a long shelf life so if I do not need it all I have to find ways to use what is left over. 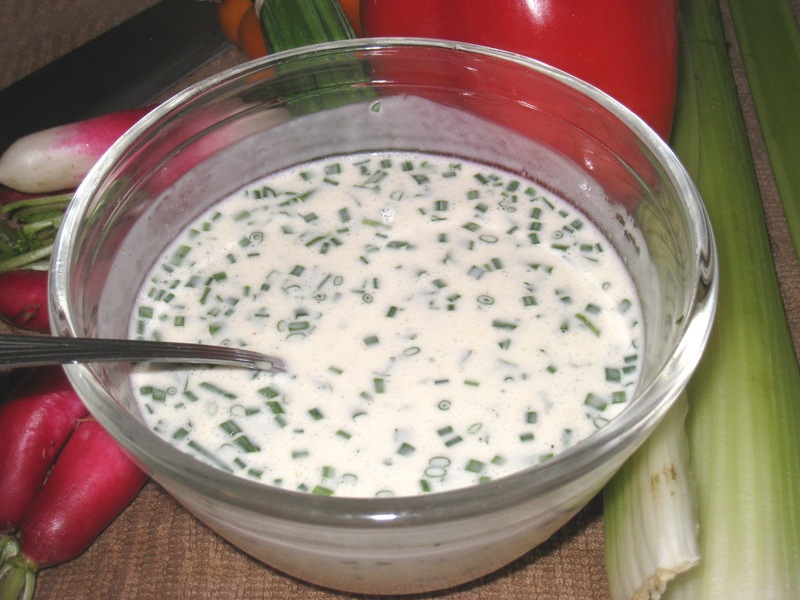 Enter Buttermilk Ranch Dressing. It had long occurred to me that it should be fairly easy to make, as the packaged mix was added to mayonnaise and buttermilk, so the last time I made mayonnaise and had some left I did a quick search online and found an easy peasy recipe posted by Elise on her wonderful site Simply Recipes. There are two differences between her recipe and what I made. The first is that I used homemade mayonnaise. The second difference, as you can see immediately if you compare our photos, is that I used more herbs in my version. Hers also looks a bit thicker than mine, but I don't know whether or not that is just the way it looks, or our measures were slightly different, or this batch of my homemade mayonnaise was thinner. Whatever the differences, the end result was complete and utter deliciousness. Now that spring has arrived and I can get greens at the City Market, I have made this three times in the past few weeks. I even made mayonnaise specifically for the purpose. 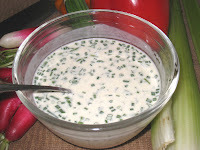 But you don't have to make your own mayonnaise to enjoy the benefits of making your own ranch dressing. Even if you use prepared mayonnaise it will taste so much better than any prepared version you will find on your grocer's shelf (and have less chemicals in it if you care about that sort of thing). You can find the recipe here. Enjoy!